Here we have the unique example of a TV Special being a sequel to two different other Christmas TV franchises at the same time. I guess the folks at Rankin & Bass felt they couldn't lose by combining two iconic Christmas characters… in a somewhat non-Christmas special. Here, Frosty makes the jump from traditional cell animation into Rudolph's world of stop-motion animation. We also learn that Frosty and his wife Crystal now have 2 kids, Millie and Chilly. Oh, and they now apparently consider their reindeer friend as "Uncle Rudolph." The villain from Frosty's Winter Wonderland, Jack Frost, makes an appearance, as does the whale Big Ben, who helped Rudolph in Rudolph's Shiny New Year. This is the crossover sequel to top all crossover sequels! 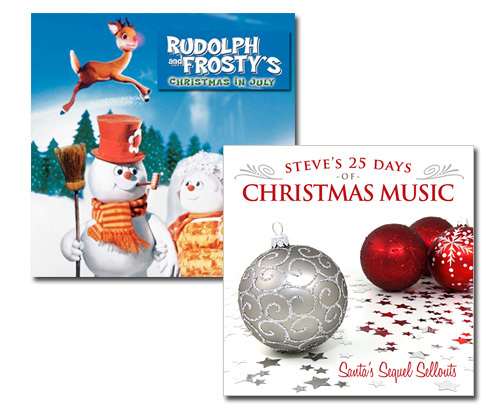 Today's song — Rudolph and Frosty's Christmas in July (Overture) — is the introduction to the special, where you will hear some dialogue between Frosty and Rudolph, as well as a variety of musical themes. Originally designed to be a theatrical film, it debuted in the United States on ABC instead, on July 1, 1979. Talk about attempting to extend a Christmas franchise into the summer months!